November | 2016 | Loch Lomond Livestock Ltd. I loaded out most of the remainder of this years market lambs and the cull ewes today. 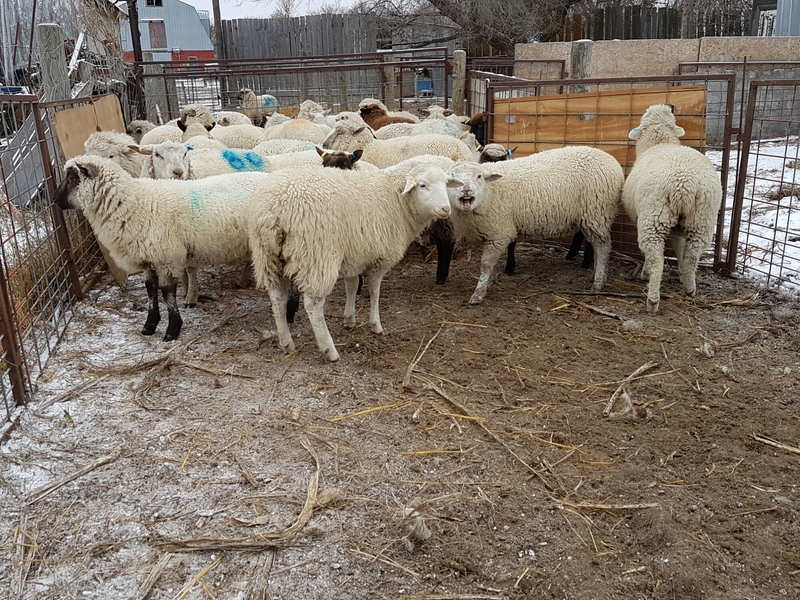 We are left with a small group of lambs to butcher, a trailer load to sell direct to slaughter, and a few ewes that I kept to work the stock dogs with. These ewes are mostly border line culls, so if they end up bred it shouldn’t be a big issue. These lambs were the smaller lambs, and unfortunately did not grow as much as I’d hoped since the other lambs were sold. They were out on pasture until this week, but obviously the quality wasn’t as good as I thought. 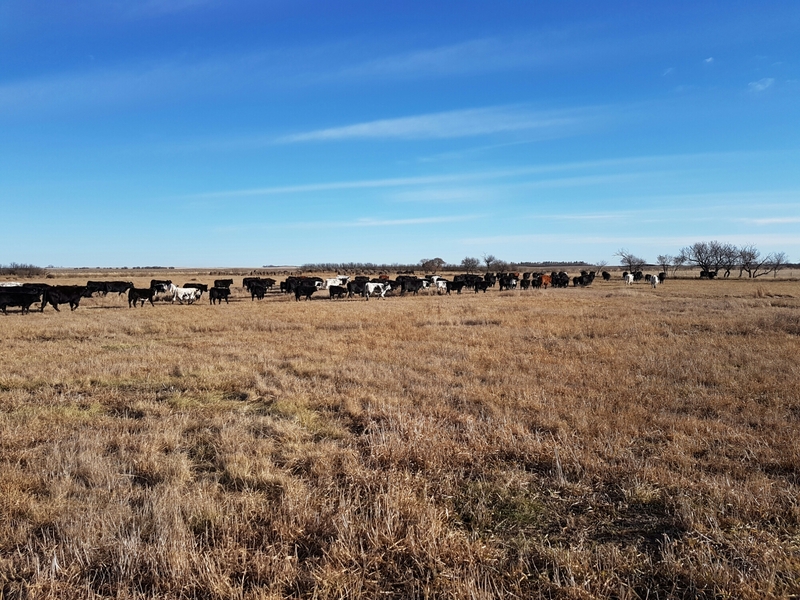 This fall has been busy and trying in many ways with the wet weather in October, extra cattle, and other jobs taking up more time than anticipated. So another job of feeding these lambs just didn’t fit in the day. At this point, all we can do is accept what we have, be glad they are healthy, and try to improve next year. 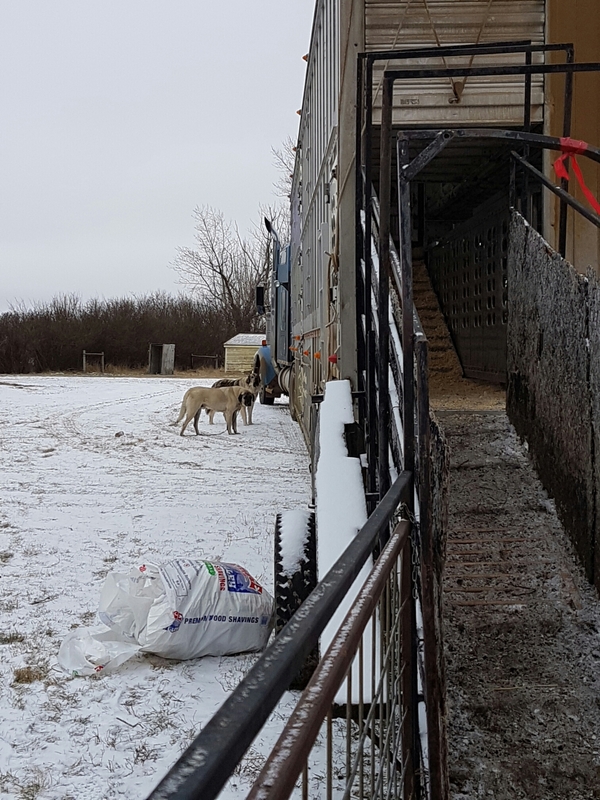 Ruza and Thor came to see what was happening to their sheep. 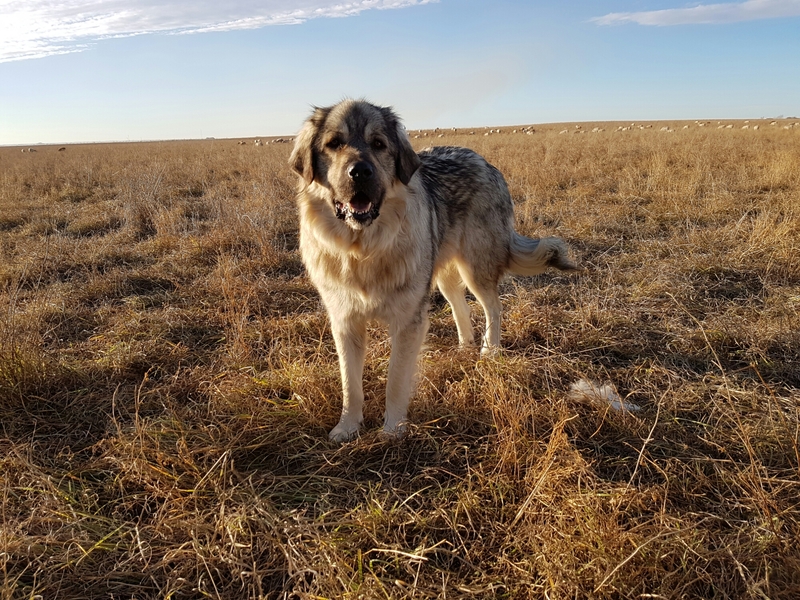 Ruza took offence and barked at the truck for awhile, but alas, it didn’t give up the sheep. Another month has nearly gone by in the blink of an eye. 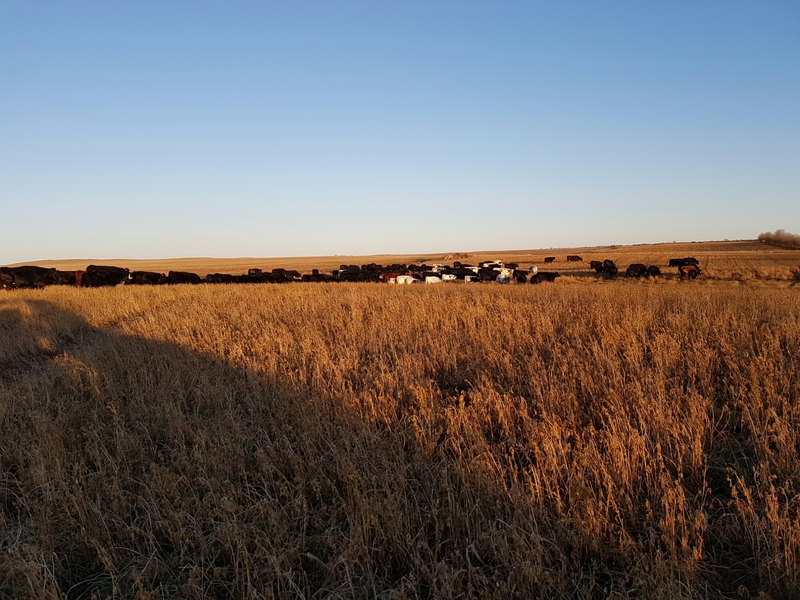 The days are filled with feeding and checking the animals, doing fall jobs that need to be done before the winter and trying to finish up combining our flax when the weather allows. I have been working two days a week at the bank as well, meaning other jobs need to get done during the rest of the week, or in the few hours of daylight before and after work. 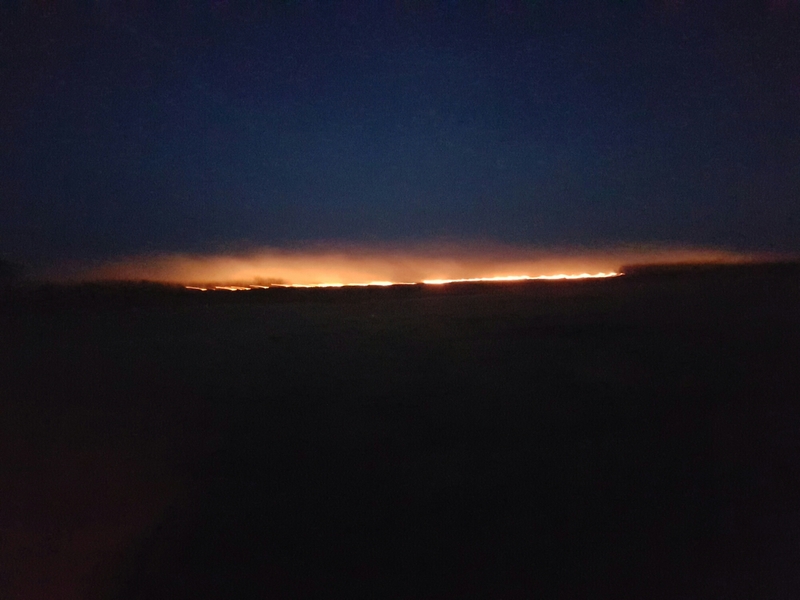 This is a fairly regular sight these days, as farmers burn flax straw that is too course to break down over the winter. With as many dogs, people and livestock around as we have, there’s always something to go wrong. This time the unlucky critter was Jack, my main border collie working dog. While moving cattle home the other evening, he nipped at a calf to keep it moving. Unfortunately, the calf kicked back and stepped on his foot, fracturing two bones in one of his hind legs. 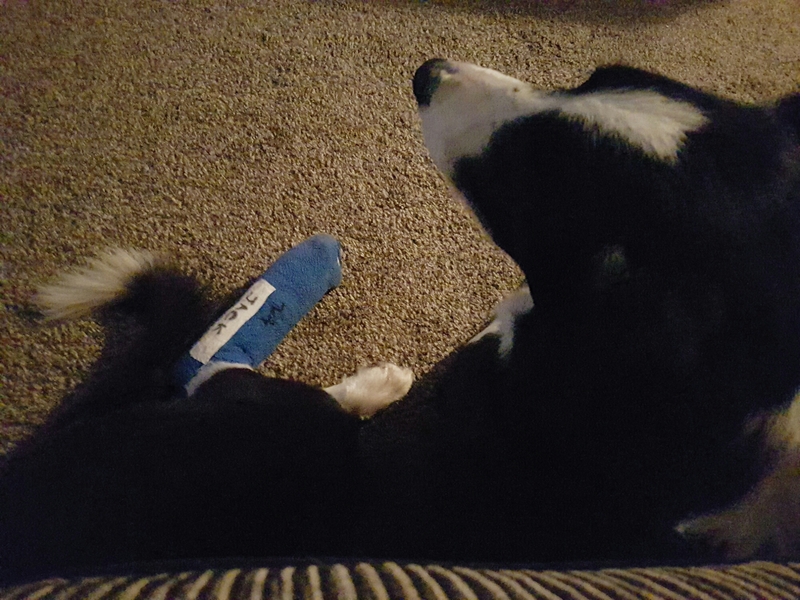 A vet visit and a splint later, he is resting comfortably. The break does not look severe and should heal well if all goes as planned. The next challenge will be to keep him from using it too much before it is healed. He is under house arrest for the most part, although I have been giving in and giving him the odd ride in the side by side. Ruza, my most recent guard dog adventure, seems to be a success. I got her as a puppy about 2 years ago. We had our struggles, and she still occasionally aggravates me, but we seem to be moving out of the puppy stage. She is becoming a reliable guardian for the sheep. She and Sam are currently looking after the approximately 400 ewes, and there have been no issues. It is always rewarding when an investment of both money and time work out, and it makes me think about the next project. I am thinking about getting one or possibly two pups next year, as Alice is starting to have some hip issues and I would like to give her an easier job. Right now, I’m just in the thinking stage, and keeping my eyes and ears open for the right breeder to get the right pup from. 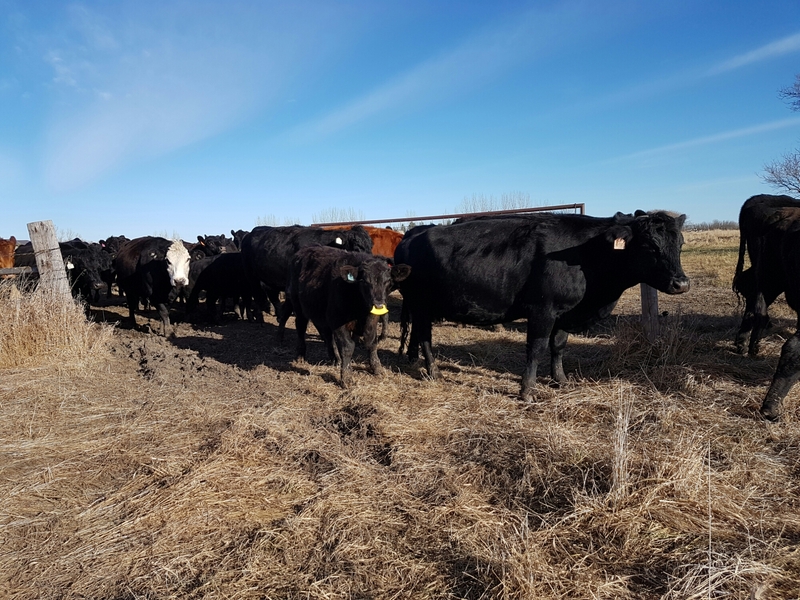 We recently expanded our cattle herd. This wasn’t exactly a planned expansion, but due to some unforseen circumstances. This spring, our neighbour and cousin died from suicide. He was a very big part of our life and it was very devastating. We had similar philosophies, and he was the only other organic grain farmer left in the area. Gordon was very caring and community minded. He would always help out if we needed a hand, and he and my dad almost always combined together, first doing his crop and then doing ours ( or vice versa). His death has been hard on all of us. We decided to offer to purchase his cattle, in part because of the emotional connection. Walking through these cows, we are able to appreciate his efforts, and remember him. Some days it is hard, to realise that he is gone and looking after these animals is our responsibility. And some days it is peaceful, knowing that these cows can stay on the land they’ve grown up on, living a life he would approve of. Yesterday we brought the cows and calves into the yard, vaccinated the calves and put Quiet Wean paddles in the calves noses. It was a beautiful day, and we were done by early afternoon. We will bring them back in a week, take the paddles out of the calves and separate the cows and calves. There has been lots of talk lately about the recent announcement of the coming implementation of a carbon tax. 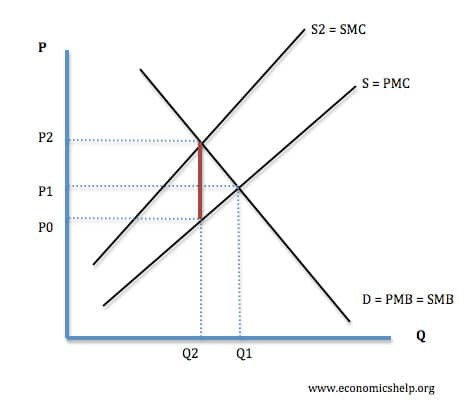 The purpose of a carbon tax is to add the social and external cost of a product to the actual cost of that product. This corrects for a market flaw which doesn’t account for these costs, so they then become social costs, as evidenced by climate change. It’s easy to see how our consumer society ignores these social costs. Price is king while quality is rarely considered. Nearly everything we buy is packed in plastic and our landfills are filled with wasted food. Hopefully by allocating costs to these practices, our society will become less wasteful and more aware of these external costs. I have also heard some recent rumblings about the impact of plowing grasslands on release of carbon. It is estimated that prairie grasslands hold about 80 tonnes of carbon per hectare; most of which is held in the soil itself. By using the land for cropping, 25- 30% of this carbon is released into the atmosphere. Estimates are that for every tonne of carbon decomposed, 3.67 tonnes of CO2 are released to the atmosphere. At a price of $15/tonne for CO2 equivalent, the value of this stored carbon is over $1100/ hectare (or just under $450/acre). (Full disclosure, I found these figures online and am not a climatologist, so cannot be certain they are correct). And yet there is little incentive for producers to convert marginal crop land back to grass, or to keep that marginal land in grass production. 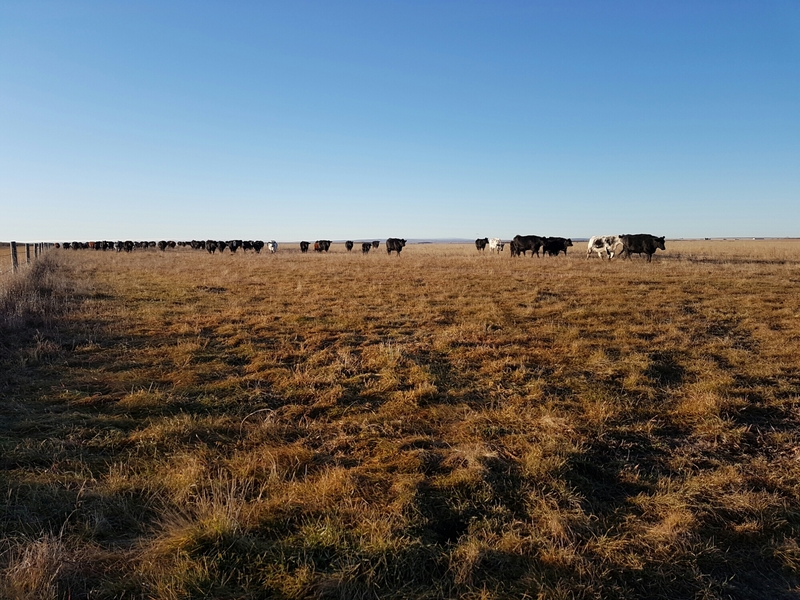 As soil becomes degraded, it loses its ability to store carbon, while methods such as grazing, crop rotations, no-tillage and composting help to regenerate the soil and improve its sequestration abilities. 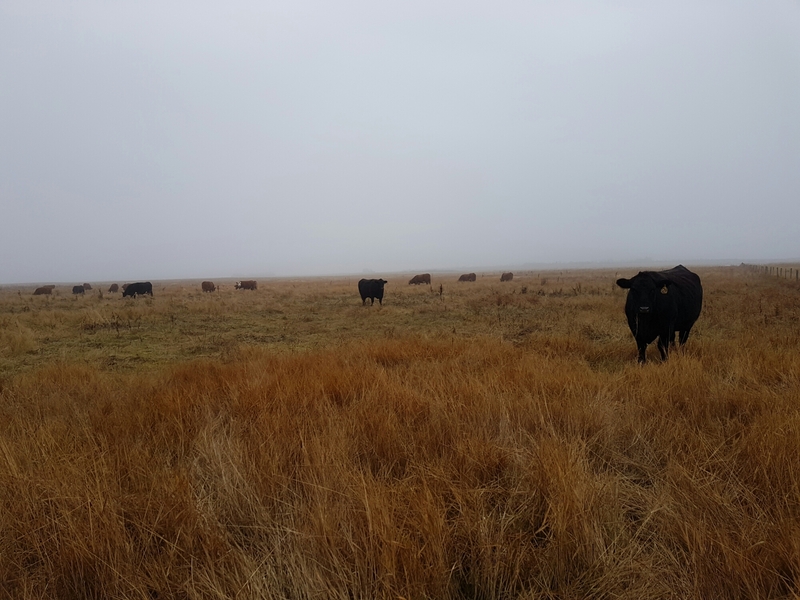 One of the overlooked ways to combat climate change may be a combination of using ecological methods on productive land to produce grains, oilseeds and legumes for human consumption, and maintaining other areas in grass to produce meat for human consumption.